Store Like a Champion Today. Grooms was familiar with high-density shelving from his previous position with the University of Minnesota, so he knew that type of shelving could double the football team’s storage capacity within the same space. 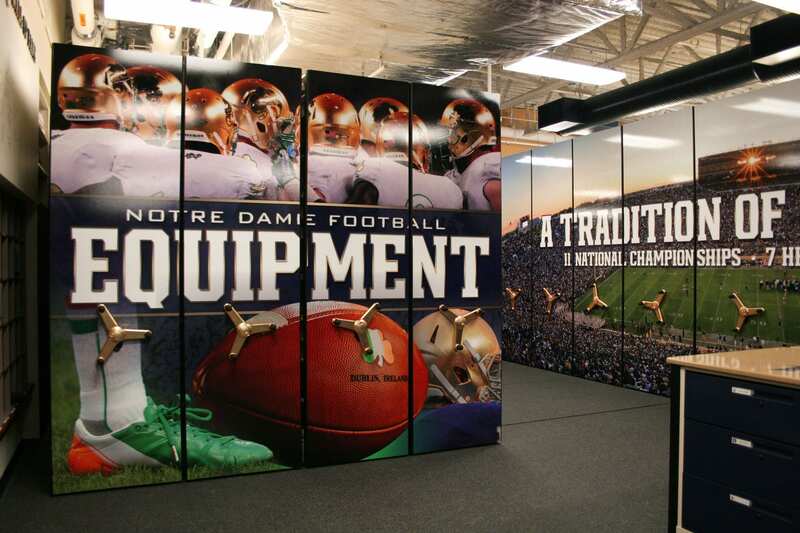 Having designed many sports equipment rooms for professional and college teams alike, we know the most important component of Notre Dame’s space would be careful consideration of the various types of gear needing to be stored. Many people who aren’t in the athletic equipment industry don’t realize how many pieces it takes for a team to operate to the best of their ability. 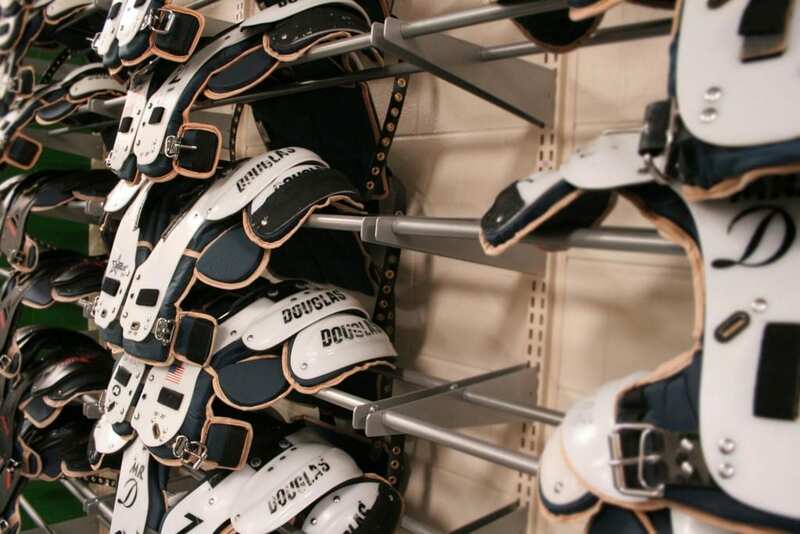 Each player on a typical football team has separate practice gear (jerseys, shorts, pants, helmets, shoes), cold weather gear, shoulder pads, gloves, warm-up suits, travel shirts, socks, game day gear (jerseys, pans, helmets, pads, cleats), workout shoes, and more. Multiply that by close to 100 players, and available space gets compromised pretty quickly. Working closely with Grooms’ sketch, we began with the room’s exterior walls. This is where the team’s game day and practice gear would be stored, and the goal was fast, organized access. 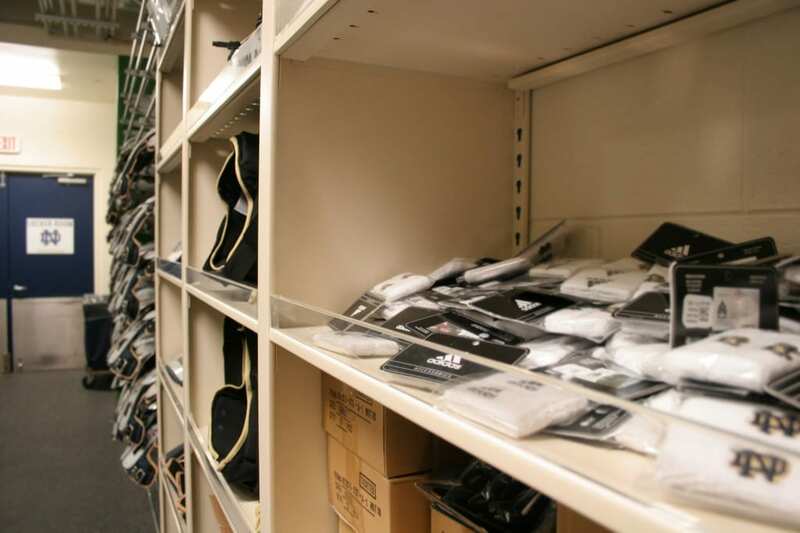 Stationary metal shelving optimized for specific types of gear were designed around the room’s perimeter, allowing for easy access and convenience. We knew that in order to get the maximum storage density possible, we would need to utilize compact mobile storage systems. 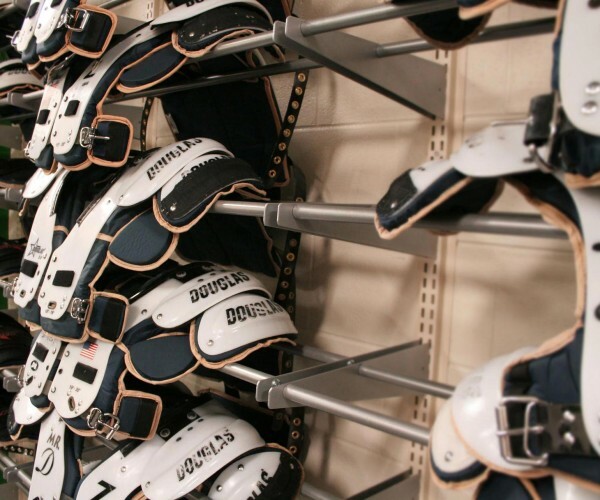 As the mobile storage eliminates fixed aisles, it would be far easier to accomplish one of the team’s biggest priorities—personal storage space for every player. Next, we installed a high-density mobile storage system, which was put in place to store items specific to each player. Players would receive their own personal area that was far bigger than the previous space they had. 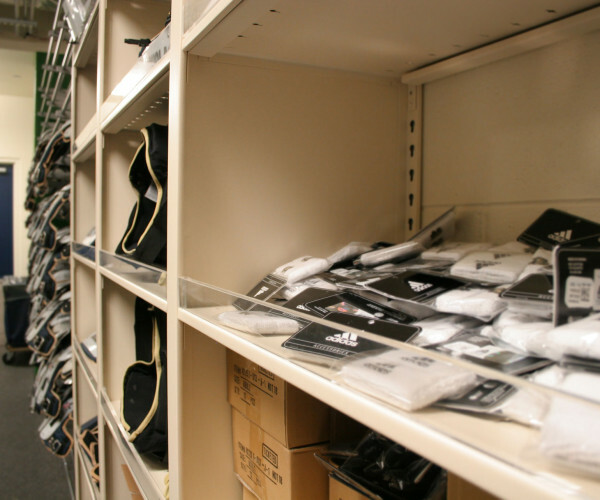 This extra space made things easier for equipment managers as well, by equipping the players with the necessary practice and game gear they needed. Utilizing 4-post shelving within the mobile systems, each player was able to have their own cubby for personal items—one that was far larger than their previous space. 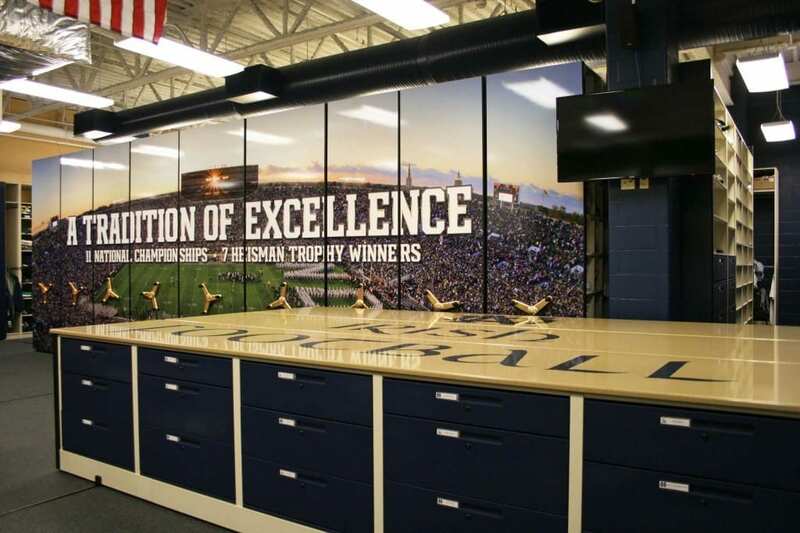 Having this extra space cut down on the crowding in the room and became a place where players were comfortable to get dressed and get into a game mindset before taking the field. 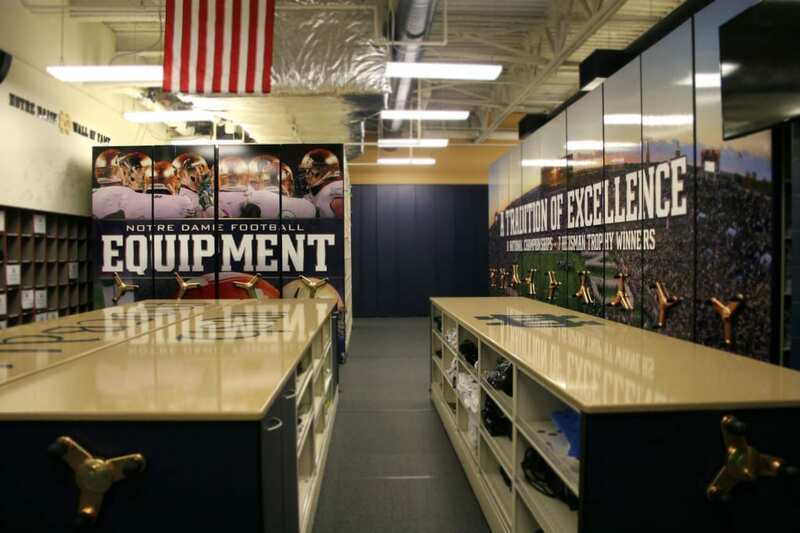 Notre Dame employs 25 student equipment managers to make sure the football equipment room—and everything in it—runs smoothly. In the room’s old configuration, staff used to bring in large folding tables in order for the student workers to fold clothes. Apart from the extra work, the folding tables could only support a few students at a time, and tasks took longer than they needed. With a focus on giving these students a more conducive place to work, we designed a 36” compact mobile system ideal for folding. 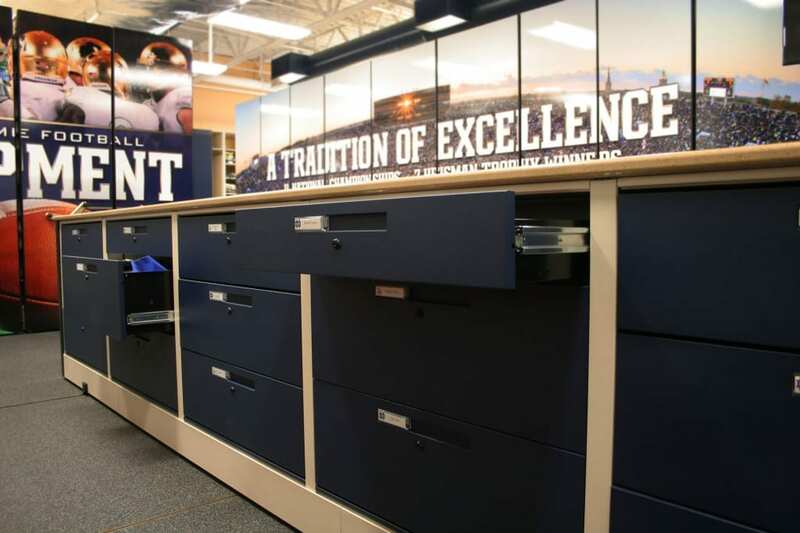 The counter-height system is outfitted with doors and drawers to maximize storage space—and now, 15 equipment managers can fold clothes at the same time. 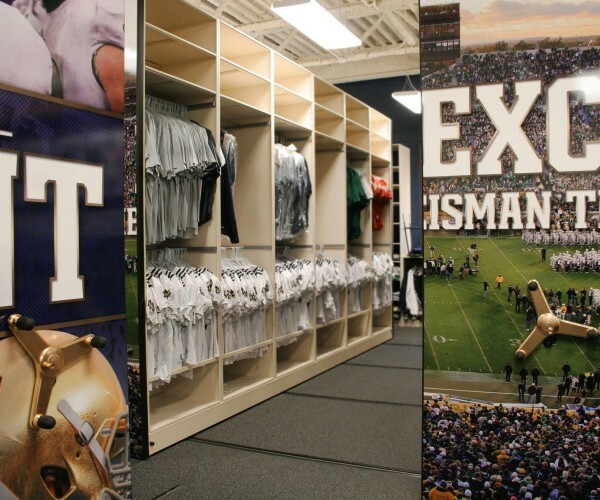 Notre Dame’s revamped football equipment room allows the team’s equipment to be better organized, more visible, and easier to maintain and access than ever before. It also allowed the University to create another way to impress potential recruits. Modern football recruitment isn’t just about a world-class program. It’s about showing potential players that you care about their wellbeing—and that all aspects of the program are high in quality. 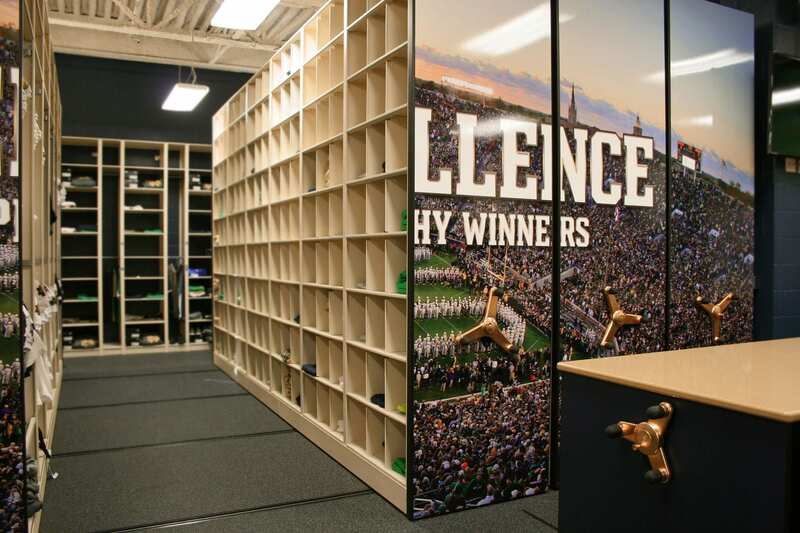 The mobile systems in the University’s equipment room all feature custom graphics that showcase Fighting Irish football—from close-ups of the team’s helmets to an aerial shot of the stadium. Even the system’s handles were sent to the team’s helmet company to be dipped in the same shade of signature gold. Additionally, the counter-height system in the center of the room is topped with a custom-designed quartz top that includes an inlay of Notre Dame’s logo and the words “Irish Football” into the surface material. In locker rooms, not every storage challenge is created equal. Contact us for a complimentary space assessment to find out how we can solve yours.